A remake of The Legend of Zelda: Ocarina of Time for the Nintendo 3DS. Along with graphical enhancements, the touch screen is used to manage your inventory, allowing you to switch items quickly, and the motion sensor allows you to aim your weapons more easily. New stones can be used to have "Visions", giving hints on how to proceed. After meeting certain conditions, new modes are available, including Boss Challenge and the Master Quest, featuring modified dungeons, a mirrored overworld, and double damage from enemies. When you enter the Hyrule Castle garden where you first meet Zelda, look through the window on the right. The room inside contains blocks, pipes and a background design based on New Super Mario Bros. This replaces the Mario picture cameos from the original game. Most of the interiors in the game have been redesigned. Inside the Happy Mask Shop in Hyrule Castle Town as Young Link, there are shelves covered in masks. All of these masks were originally found on the Happy Mask Salesman's backpack in The Legend of Zelda: Majora's Mask. You can even see the backpack hidden behind the Happy Mask Salesman. The Mario mask from Majora's Mask is just barely visible behind the mirror in the shop. Hidden in the game are three pieces of artwork from The Legend of Zelda: Skyward Sword, a future title at the time of this game's release. 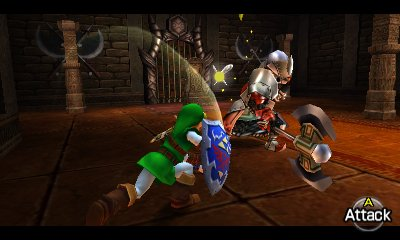 All three depict Link slashing his sword in different poses. As Young Link, go to the Bombchu Shop in Hyrule Castle Town at night. Speak to the shopkeeper and scroll over to the left to see the first picture. As Adult Link, head into the house at Lon Lon Ranch and go up to Ingo's bedroom. To the left of the door are two pots. Break them and you can see the second picture leaning against the drawers. As Adult Link, go to the Gerudo Fortress jail where you are thrown when captured. Hookshot out and jump across to the platform on the left where you can see a door. Go through and follow the corridor to a room with two Gerudo guards. Break the crate in this room to find the third piece of artwork.